If you’ve been thinking that Pinterest is not a top marketing priority for your brand, you might want to think again: over 250 million people use Pinterest every month and 93% of online consumers visiting Pinterest having a clear intent of purchasing products. And while some consumers may feel overwhelmed by branded content on other networks, 78% of Pinners welcome content from brands, with 66% going on to make purchases from branded content posts. Clearly, Pinterest is an invaluable resource for marketers. 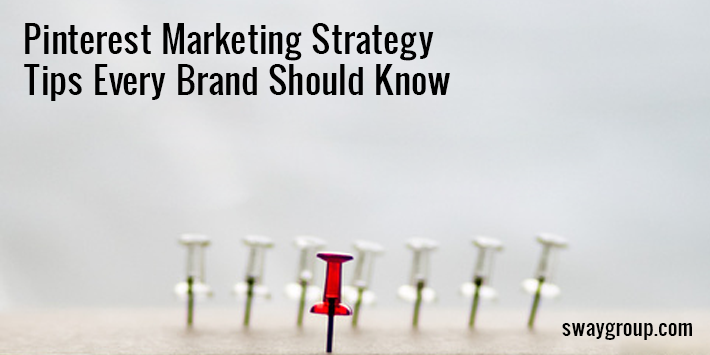 But it can be difficult to know how to best utilize it for your brand. Luckily, we’ve got some expert tips on how to improve your Pinterest marketing strategy. Rich pins include extra information in the pin itself, depending on the type of pin it is. There are now 4 types of rich pins: app, recipe, article, and product. Rich pins stand out in the search results on Pinterest and can provide information on how much a product costs or where something is located with just a glance. They also add a layer of transparency to pins, giving the user a clear view of where the pin will take them if they click through to your website. Buyable Pins take things a step further, by allowing you to sync your online shop to your Pinterest account. People can shop and buy from your site without ever having to leave Pinterest. Your board names and descriptions should be clear, concise, and descriptive. They will help users find your content through search and give them an idea of what to expect. Create titles that match keywords a user would search to find a board of that topic. Keep the board descriptions short and to the point, using similar keywords as the board title. Pinterest is an image-first site, and there is a lot of value in adding interesting photos that are of the optimal size to your post. High-quality lifestyle photos tend to be the highest performers. Additionally, the more representative the pinned image is of your content, the more likely someone will repin or click through to your website. The image should be descriptive and make it clear at first glance what the content is about. Adding text on top of an image is a popular way to help users easily distinguish what your pin is about. Take a look at your followers, your target customers, and those repinning your content and pinning from your website. See what they’re interested in – what they are pinning about, who they follow, who they repin, etc. Use this information to inform the content you share. You can also follow them back, repin their pins, leave a like or comment on other pins. Keep in mind that Pinterest has evolved over the years is more of a search engine than a social network. With more than 50 billion Pins on any number of topics (1.7 billion recipe Pins alone), marketers need to focus on making their content as searchable as possible. Learn more on how to do this in our AdWeek’s Social Daily Pro op-ed. Next PostWhy Does Influencer Marketing Work?